Given the natural process of aging and decrease in collagen production, the perpetual loss of volume and decreased skin elasticity causes the face to elongate, as cheeks hollow out and begin to droop. Meanwhile, lines and wrinkles appear along the corners of the nose and mouth, creating a less than appealing expression. This means that while one may feel happy and energetic, their face may tell a different story. With this in mind, perhaps it’s time to usher in the New Year with innovative cheek skin tightening to refresh and redefine the shape of your face. The K Spa combines Microneedling with RF energy, generating a unique approach to signal the production of collagen, elastin and hyaluronic acid. The process is simple, and treatment is delivered using a small hand-held device. To better understand, consider traditional microneedling, which involves creating tiny “micro-injuries” along the surface of the skin. Because this stimulates the body’s natural healing responses, collagen and elastin production begins. This alone tightens skin and continues to provide superior results in reducing acne scars, fine lines and wrinkles. Yet, when the layers of skin are heated with RF energy, the natural reparative and healing process is amplified. Patients have noted better results, with thicker, firmer skin, fewer wrinkles, healthier skin tone and a gradual lifting of the cheek area. Perhaps the greatest benefit of innovative cheek skin tightening at The K Spa is that it is occurs naturally over time. This is based upon the production of collagen, elastin and hyaluronic acid, a process that continues for months following treatment. 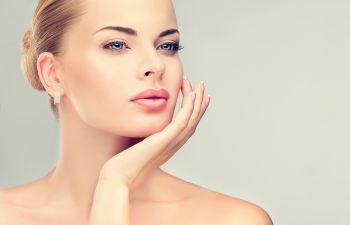 Furthermore, busy patients or those that hope to avoid a surgical cheek or facelift procedure have found the minimally invasive treatment to produce beautiful results in facial rejuvenation. At any age, The K Spa believes that you deserve to look your best. That’s why we take a personalized approach to treatment, combining the best, most-revolutionary procedures available to address your unique aesthetic concerns and preferences. This is the vision of The K Spa, as noted by founder and double-board certified facial plastic surgeon, Dr. Benjamin Stong. To take advantage of top quality cosmetic treatments and procedures overseen by one of the country’s leading facial plastic surgeons, contact The K Spa today. * Disclaimer: These Are Actual Results For Patients Of Dr. Benjamin Stong. Plastic & Cosmetic Surgery Results Can Vary Between Patients.